The Dental Education Unit and Internal Quality Assurance Cell of Indira Gandhi Institute of Dental Sciences, Sri Balaji Vidyapeeth, conducted a two-day workshop on “Empowering the Teaching Expertise” on 31st January and 1st February 2019. This is the first module on the series of Empowering Dental Educators workshop for 2019. 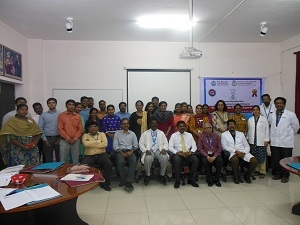 The workshop was attended by 20 dental faculties from Tagore Dental College, Meenakshi Ammal Dental College, Chettinad Dental College, Chennai, and interested practitioners. Prof. R. Saravana Kumar, Principal, IGIDS, delivered the welcome address and honored the guests. The Guest of Honour Dr. J. Sabarinathan, Director (Academics), Vinayaka Mission University, inaugurated the workshop by playing a video on the Journey and achievements of Dental Education Unit and addressed the gathering. Prof B.V. Adkoli, Director, Centre for Health Professions Education, SBV addressed the gathering. On 31st January 2019, the following sessions were conducted. Education as a system and Taxonomy by Dr. Sabarinathan, Teaching-learning principles by Dr. Shivasakthy, Specific learning Outcomes by Dr. Suganya, Teaching Learning methods by Dr. Senthil, Dr. Shivasakthy and Dr. Pratebha. On 1st February 2019, the session started with Rapporteurs session followed by Problem Based learning by Dr. Manoharan, Students Needing Additional Curricular Support and Psychological Support by Dr. Shivasakthy, Teaching Learning Media by Dr. Jananni, Lesson Plan by Dr. Saravana Kumar and Introduction to microteaching by Dr. Sanguida. Online feedback was obtained for each session. Three delegates performed the practical microteaching session. Certificates were distributed after the open feedback session from the participants.